I recently went rogue and left my full time gig. 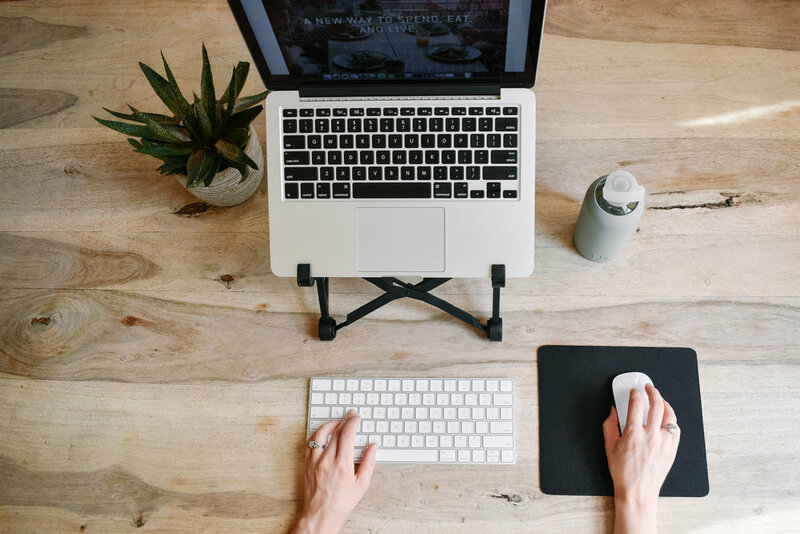 Now I'm freelancing as a product marketer and growing this blog from a co-working space in SoHo. After some trial and error, I'm working lean so I thought I'd share the gear that let's me get everything done without weighing me down. 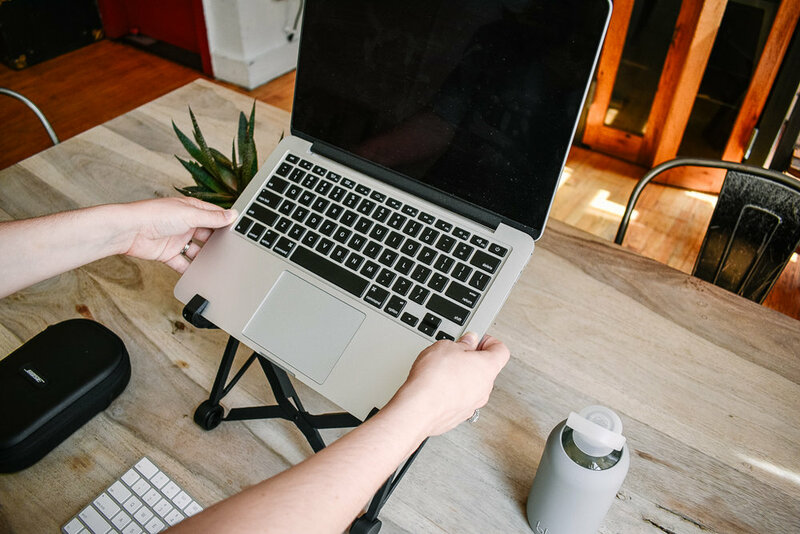 I use the Nexstand to elevate my laptop for better ergonomics (avoiding the double chin look on video calls is also nice). 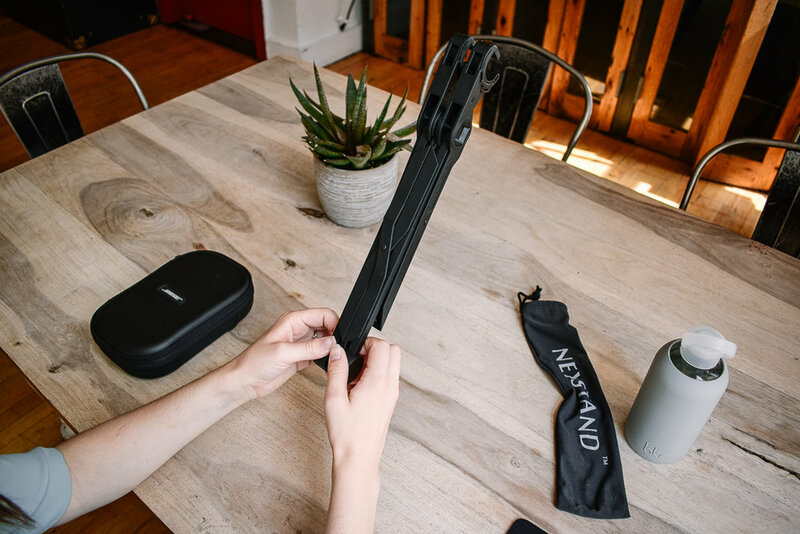 It easily folds up and stows in its carrying case. It weighs 8 ounces and can hold up to 20 pounds, 2 to 6 times the average weight of a laptop. 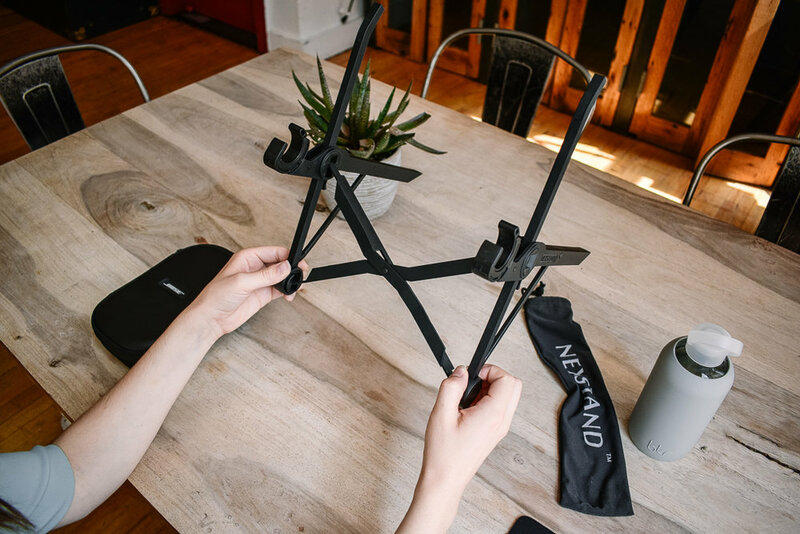 As I understand it, the Roost Laptop Stand is the bonafide original and is worth checking out, but for a third of the price I opted for the Nexstand and it's been working well. These don't need any introduction, but the latest keyboard and mouse from Apple are super portable and no longer use throw-away batteries. The Incase laptop sleeve made out of neoprene keeps my laptop from spills or getting dinged up while it's in my bag. It also happens to fit my keyboard and keyboard/mouse charger. Bose Noise Cancelling Headphones are a long time staple of my small space and frequent flyer lifestyle. They are perfect for loud co-working spaces, watching TV without your significant other having to listen, and drowning out crying children on airplanes. Print isn't dead after all! I have business cards for my marketing consulting and postcards for my blog—both designed and printed with Moo. They are a great supplement to my elevator pitch and I use a special URL on my blog postcards so I can track website traffic originating in print. My husband prefers the Contigo coffee thermos which is great for leak proof sipping. I like the Klean Kanteen better because the simple loop cap is easier to clean and carry. I use the Bkr water bottle after much experimenting. The Swell water bottle is pretty trendy but is thin so it knocks over easily. The Soma water bottle is made by a B Corp which is great but has the same flaws as Swell and the wooden cap cover separated from the cap after some use (wood glue didn't fix it). I use the Joshuvela Baja Backpack (use coupon code "THANKS10" to get $10 off) to carry all my gear. It's sturdy as hell, looks great, and is produced ethically in San Francisco. My favorite feature is that it can be carried as a tote bag to look dressy for client meetings, or slung over my shoulders for ergonomic walking without making me look like a college student. A close second would be the Everlane Packable Backpack. I love the design and all of Everlane's products are ethically produced. The daypack is all the gear I take to "work" but the duffel bag is what I leave at "home".